"I'm in awe of her career," says Zeta-Jones of her co-star. "How dare I ever, ever publicly announce that I feel tired when I see her doing eight shows a week?" 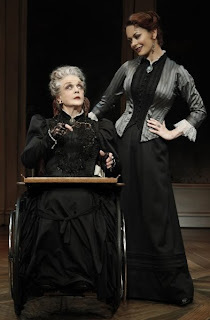 From the beginning of the run on November 25, 2009, of A Little Night Music, neither Catherine Zeta-Jones nor Angela Lansbury, and possibly no other cast member, has missed a performance. However, Catherine will be missing performances from Tuesday - February 16 to Sunday - February 21, 2010, and Tuesday - March 30, 2010, to Sunday - April 4, 2010. Angela Lansbury will be performing during these dates. Fortunately, relief from the astronomical ticket prices for these two weeks is offered via a discount at Broadwaybox.com. I assure you that, while Catherine is billed as the star and has the lead actress role, you will not be disappointed when you see the organic performance of Angela Lansbury. Plus, Jayne Patterson will be playing the role of Desiree. I'm told she's worth the ticket.